Meet your food-loving guide in front of Vigo’s Marine Station in the late morning, and set off on a stroll through the historic port district to a local market. See the interplay of old and new as cobblestone streets unfold onto this modern urban marketplace where stalls are stocked with a vibrant array of produce, meats, and the fresh seafood supplied by local fishermen. It's a great place to explore the raw ingredients used in typical Galician cooking. 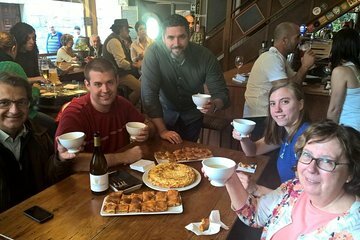 Continue on to a cozy bar nestled near the Cathedral of Santa Maria for a taste of authentic tapas like Spanish tortillas and empanada Gallega (Galician pie). Soak up the ambience while sipping regional Ribiero white wine out of tazas, traditional ceramic drinking vessels. Next up on the mouthwatering itinerary is a vinoteca (tavern) known for its great selection of Galician wines. Here, taste how a young red wine made from the Mencia grape complements the flavor of tapas like cured chorizo and jamón plus local Tetilla and San Simon cheeses. Take a digestion break with a short stroll to reach the final stop. No visit to Vigo is complete without a taste of fantastic seafood, so here you'll be treated to a dish prepared with the fresh catch of the day, often mussels or a type of shellfish, paired with celebrated DO Rias Baixas Albariño white wine. At the end of the 4-hour tour, say farewell to your guide with a full stomach and plenty of new ideas for where to dine and drink during your time in Vigo. If any of the bars/restaurants as described above are closed due to any unforeseen circumstances, we will take you to a similar venue and/or ensure you get additional tapas at the stops we can visit.